Home Who Are the Ruling Class? It’s not a secret cabal, but it is very real – and we need to do something about it. Select the links below for simple, but undeniable, explanations of who the Ruling Class are. It contains full documentation, citations, and references to support an inescapable conclusion. You will instantly know the truth of it when you read it. PRC PAC is the only political action committee totally dedicated to stopping RINO Republicans in the primaries by electing candidates that will enthusiastically support President Trump’s agenda. This requires a year-round effort and your membership can make a difference. 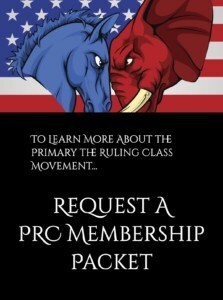 We are a grassroots organization made up of everyday Americans.To learn more about becoming an Independent Affiliate Member, request a PRC Membership Packet.